Today I found out the origin of the QWERTY keyboard. The first typewriter was introduced to the United States in 1868 by Christopher Latham Sholes. His first attempt to build a typing device consisted of a crude and sluggish machine that was far from perfect. The design used letters and characters on the ends of rods which were called typebars. When a key was struck, the typebar would swing up and hit the ink-coated tape which would transfer the image onto paper. The original design of the keyboard positioned keys in alphabetical order in two rows. Makes sense, right? Well, this arrangement caused the typebars of the most commonly used combination letters of the alphabet (ie. TH and ST) to be positioned close together, so when the keys were hit right after the other with a speed faster than a snail, the keys would jam. The attempt to solve this malfunction resulted in a rearrangement of keys. 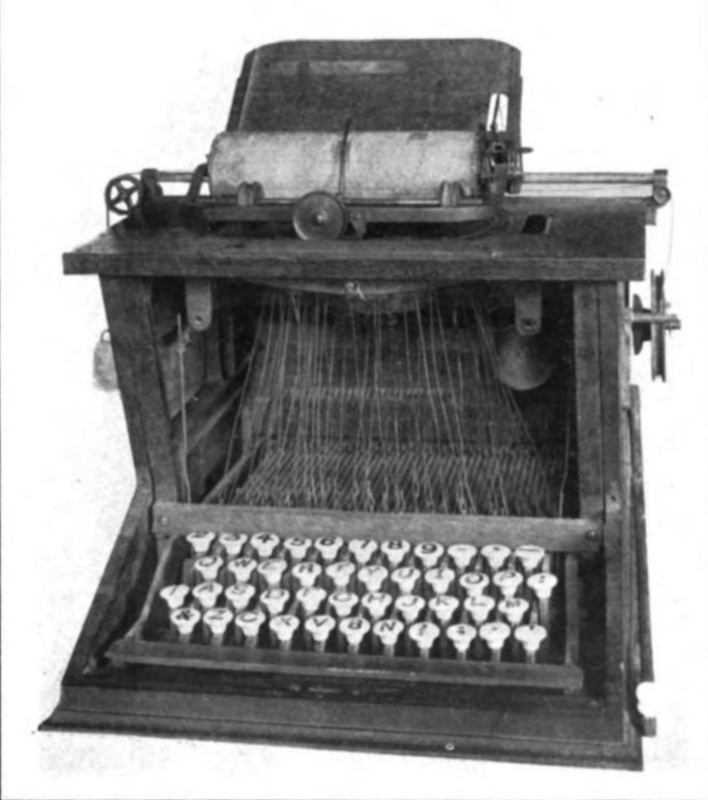 In 1868, in collaboration with educator Amos Densmore, Sholes arranged the letters on the keyboard for better spacing between popular keys used in combination. The results was that this initially made it difficult for people to find the letters they needed to type efficiently. However, someone who mastered this new key arrangement would actually be able to type faster because the keys wouldn’t jam. This was the beginning of the QWERTY keyboard, which first appeared in 1872. 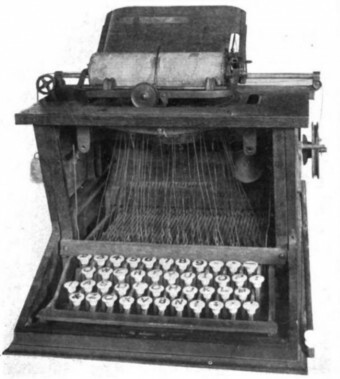 The first typewriter machine found its way on the market in 1874 through Remington & Sons. The device was called the Remington No. 1. You’re probably thinking it sold out in minutes since it was the latest and greatest technological device to be mass-produced. The truth is, most people ignored it. Sure, the machine still had some quirks and Sholes had yet to figure out ideal customers for his invention, but in the late 1870s, the idea of “mechanical writing” was just plain strange for most people. The accepted norm was to write letters in legible longhand and many people found mechanical writing uncouth or even offensive. Sholes figured his device would appeal to clergyman and men of letters first and then he’d branch out to the general public; he didn’t even consider its use in business. All of these factors probably played a part in the typewriter’s initial lack of sales. Four years later, after slight modifications to the arrangement of the keyboard were made, Remington & Sons produced the new Remington No. 2 model. The Remington No. 2 included the arrangement of keys we use today along with the ability to type both capital and lowercase letters by using the shift key. The shift key received its name because it caused the carriage to shift position in order to type either a lowercase or capital letter which were on the same typebar. Although the shift key we use on our keyboards today does not cause the machine to shift mechanically, the name stuck. As the typewriter rose in popularity, people stopped complaining about the weird arrangement of keys and started memorizing the keyboard and learning how to type efficiently. Although other alternate keyboards tried to break onto the market, most people decided to stay with the QWERTY board, and none of the other type-writing machines proved successful. One prominent attempt at a replacement keyboard occurred in the early 1930s when Professor August Dvorak of Washington State University set out to develop a more user-friendly keyboard. He ultimately redesigned the keyboard so all of the vowels and the five most commonly used consonants were arranged on the home row (AOEUIDHTNS). Although the design required a typist to frequently alternate hands to type most words, with the Dvorak keyboard, a person could type approximately 400 of the English language’s most common words just by using the keys of the home row, compared to 100 words on the QWERTY keyboard. In addition, using the Dvorak keyboard, a typist’s fingers would not have to travel as far as they did on Sholes’ keyboard to type the majority of words. Dvorak set out to prove his machine superior to Sholes’, but his keyboard never caught on. Many of the studies used to test the effectiveness of his keyboard were flawed or were deemed a conflict of interest since Dvorak conducted them himself. A U.S. General Services Administration study in 1953 of Dvorak’s keyboard determined it didn’t matter which keyboard was used. Experienced typists in either keyboard typed at approximately the same speed, with variance based more on their individual skill rather than either keyboard design being superior to the other in a larger samplesize or words. This ultimately killed the Dvorak keyboard as the majority of people didn’t want to commit the time or resources it would take to be trained on a new keyboard. Thus, the QWERTY keyboard persevered through today and seemingly will continue to do so for the foreseeable future. Author Mark Twain was one of the first people to purchase the early typewriter and is probably the first author to submit a typed manuscript to his publisher. When he wasn’t pecking away on the typewriter, Twain often indulged, particularly in his later years, in a curious hobby of “collecting” 10-16 year old girls. E. Remington & Sons, the company that mass-produced the first typewriter, was best known for their firearms. What kind of a word is QWERTY? It looks like a bunch of random letters thrown together to me; a made-up word by an elementary school kid who had not yet learned the rule that U follows Q in the majority of words. In case you’ve never noticed, the name QWERTY comes from the first six letters of the first row of keys on the standard keyboard. Some speculated that another reason the original typewriter met resistance when it was first introduced to the world was because poor spellers could no longer hide their ignorance by poor handwriting. Using the QWERTY keyboard, you can type the word ‘typewriter’ using only the top row of keys. The least expensive typewriter, produced in the late 1800s, cost only $1, and was appropriately named, “The Dollar Typewriter”. Sholes’ first attempt to create a typewriting machine was a crude piece of work made with part of an old table, a circular piece of glass, a telegraph key, a piece of carbon paper, and piano wire. An improved prototype of this device resembled a toy piano and is now in the Smithsonian’s National Museum of American History. Frank McGurrin, a court stenographer from Salt Lake City, is considered the first person to memorize the QWERTY keyboard and master touch-typing, as opposed to the hunt-and-peck method. He rose to fame when he participated in typing contests and demonstrations across the country and caused people to take interest not only in the QWERTY keyboard, but in mastering the touch-typing method. The alphanumeric keypad used on many cellphones today is called a half QWERTY keyboard. Was the QWERTY keyboard purposely designed to slow typists? I find this article largely biased against the Dvorak keyboard- citing only evidence against it. I can assure you, however anecdotal it may be, that I am typing easily twice as fast on this Dvorak keyboard after about five days of practice than I could do after multiple classes and a whole life in QWERTY. Barbara Blackburn was famous for failing QWERTY classes in school, then turning around and setting a record-breaking 212 WPM in Dvorak. Sholes actually had created his own preferable keyboard after the Remington 2 introduced spring-loaded keys, but Remington rejected it. Nextly, you said, “Although the design required a typist to alternate hands to type most words,” which is not a design flaw, but an advantage. Try tapping one finger on the table, or even random fingers from the same hand. Now try tapping alternately between hands. You’ll find that you nearly double the speed. Thus, the logic in alternating hands. I must admit, when I opened this article I expected it to shun QWERTY and introduce hundreds of thousands of readers to Dvorak. I was disappointed. Sam, I would hardly call this biased against the Dvorak keyboard. It just seems more neutral than anything else. Also, in my opinion, your experience actually backs up the GSA study that found that variance of speed depended on individual skill. You just happen to be more skilled with the Dvorak keyboard. Additionally, any study conducted by Dvorak himself is effectively useless, considering he stood to gain from the adoption of his keyboard; that’s practically the definition of conflict of interest. Finally, (and this is something I wish all proponents of Dvorak could get into their heads) switching to a new keyboard (any keyboard, whether it be Dvorak, Colemak, or any others) is not practical for everyone. (Now it’s time for my anecdotal evidence) Switching to Dvorak requires taking time away from other activities, all to get a slight improvement in typing speed that may not even have been needed in the first place. Some older manual typewriters have no keys for “zero” or “one.” You use a capital “oh” (O) and a lower case “ell” (l). Hey, before computers it didn’t matter! Very true!! Now there’s spell check and grammar check, and stuff like that. I remember that from our home manual typewriter in the 60’s. So why doesn’t someone make an alphabetically arranged digital keyboard? I would totally buy that! Was surprised that the article did not mention the fact that you can write the word typewriter using only the top row of a qwerty keyboard as thought that was part of the origin as well. yes it does. it says it in the bonus facts! GREAT ARTICLE. IT GAVE ME GOOSEBUMPS ON SHIFT-KEY PART, WHEN SDDNLY I REALISED THE CONNECT BETWEEN OUR COMPS AND THE OLD WORLD MACHINES. I CUD HAVE KICKED MYSELF, Y DINT IT STRIKE ME BEFORE. TNX SAMANTHA FOR A NICE FEATURE. Years ago, my neighbor gave me a ‘double case’ typewriter. Laugh if you want, but for lack of knowledge, I thought that they were developed for people with only one hand, (unable to press the shift key while typing). I still can’t find a good explanation behind its development. Just sharing my experience. Thank you. If it’s an antique (late 1800s) It could have possibly been a way around a patent regarding shifting. A lot of creative things have been done by people trying to get into the market legally by coming up with alternative solutions. My history teacher is curious as to where you got your information for this article because he is a typewriter enthusiast and wants to discuss typewriters . Why would they want to make typing typewriter easier? I like the bonus fact about the name QWERTY. Just as an addendum, its full name is QWERTYUIOP. I think you can guess why.